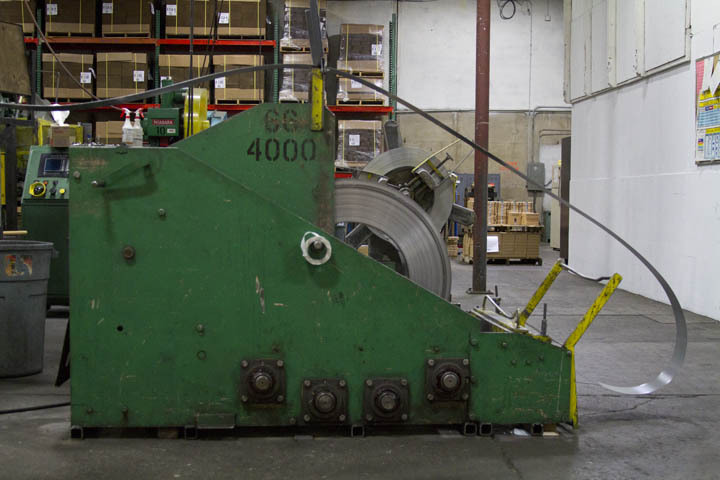 This standard reel un-coiler has no motor or actuating arm. This un-coiler simply holds material and unravels as the material is being pulled. Standard reel un-coilers have no motor or any control device that limit or dictate how much material is being un-coiled at a time. Standard reel un-coilers come in a variety of sizes, holding lite to medium sized coils. Since there are no controls to the standard un-coilers, the amount fed out at a time depends on the feeder attached to the press. 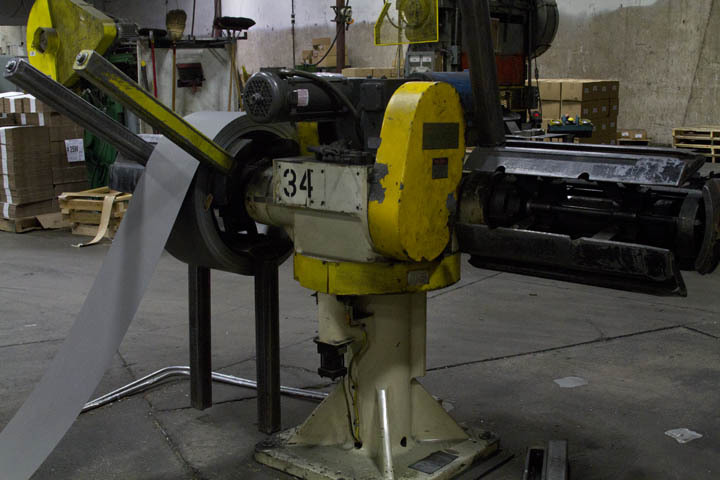 While not the most technologically advanced of all the un-coilers, standard reel un-coilers will always have a place in a stamping operation due to their low cost and maintenance requirements, and ease of moving from one press to the next. 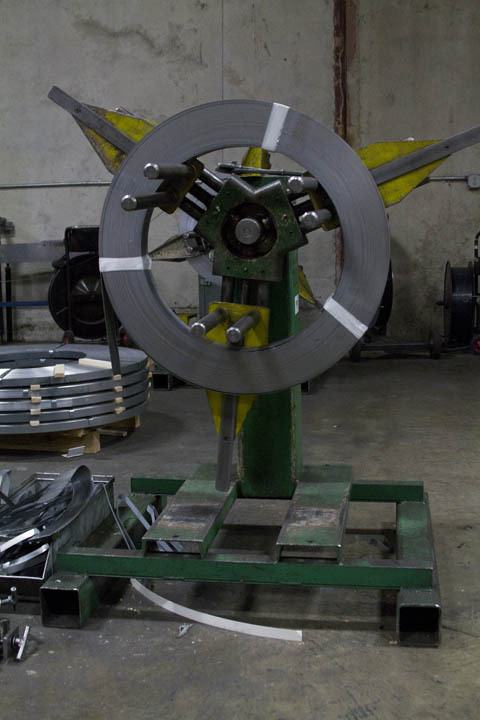 This powered reel un-coiler will stay still until the material raises high enough to trip the actuating arm and signal the reel to rotate, feeding out a pre-determined amount of the coil. Motorized reels are very similar to standard wheels, with the exception that material is fed intermittently by a motor within the un-coiler itself. Motorized un-coilers will either feed material with the aid of an actuating arm, or sensors. The more economical end of motorized un-coilers will feed material based on a time out put, i.e. feed for five seconds, where as some of the higher end un-coilers equipped with sensors will give a continuous feed depending on the material height within the view of the sensors. Motorized un-coilers are typically preferred to non-motorized un-coilers as it helps reduce wear on feeding mechanisms. 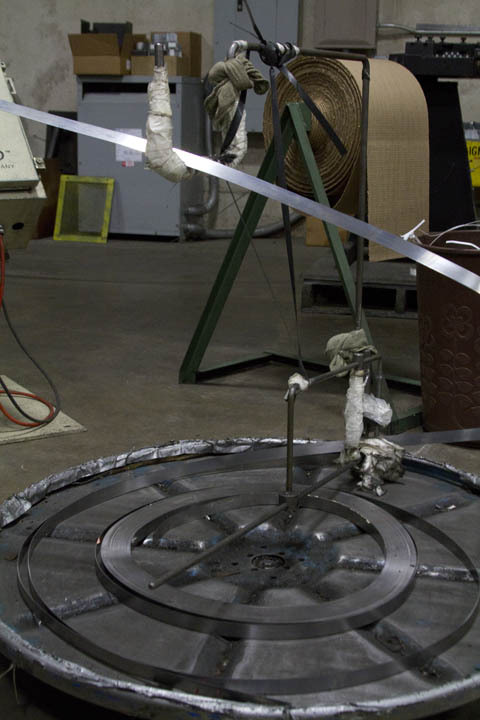 A pancake un-coiler rests material on its side and allows the material to slowly unwind. Pancake un-coilers are similar to the standard reel un-coilers, with the exception that the material lays horizontally on a flat surface, as opposed to being elevated on the un-coiler vertically. Pancake un-coilers are great for coils that aren’t perfectly round, or to be able to stack multiple coils on top of each other, speeding the process of getting a new coil set up and reducing press down time. This cradle uncoiler releases material as it is pulled against the yellow actuating arm. The amount that is fed is capable of being changed depending on the running product’s need. Cradle un-coilers are another option for managing material, especially larger coils. Cradle un-coilers are better to use for larger coils as the weight of the coil isn’t resting on an extended arm like it would be with either a standard or motorized reel. Most cradle un-coilers will feed material with some sort of motorized function since there would be too much weight needed to be pulled by a feeder. A tandem un-coiler has the great flexibility of being able to load a coil of steel on an open arm while the side in use is running low. This can greatly decrease the down time from when the original coil runs out, and the next coil is in the press and running. Tandem un-coilers are immensely helpful in reducing press down time. 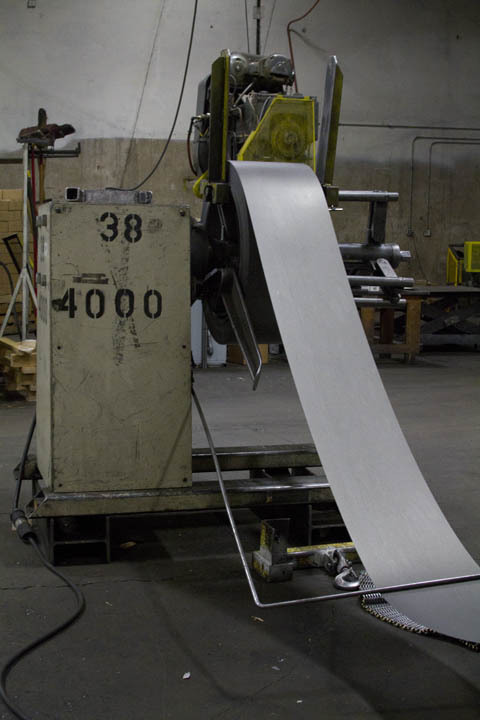 While possessing two separate arms to load coils on to, a second coil can be loaded on to the open side while the press is running the last bit of the original coil material. Once that first arm’s material is all used, a motor allows the main body of the tandem un-coiler to rotate and use the full coil of steel already on the other side. The only down fall of the tandem un-coiler is its price, as the tandem un-coiler tends to be the most expensive of all of the un-coilers we’ve looked at today. This entry was posted in Metal Stamping on April 9, 2014 by johnatmetalproducts.